The global magazine publishing sector is going through a time of great transition. As the evolving of internet speed solutions and new devices for delivering digital content arrive on the scene. The race is quite literally on – the fastest to the finish line wins… Many companies ensure they are with the best internet provider. With broadband and fibre optic promising speeds we have never experienced before, it is a changing time for online marketing, distributing publications, and the way we share files. The rush for online superiority is on and the degree of competition is increasing everyday. The circulation: Never before has this industry seen such dramatic changes – reaching markets globally with a digital publication is now easy. With a simple click your publication can travel digitally in seconds. Not to mention the money and time saved on printing and distribution costs. Mobile and tablet apps are breathing new life into magazine market share, making the accessibility of a magazines an easy commodity to utilize. The advertising: Advertisers are embracing the ability to have their ads clicked – as there are many insights to be garnered from customer behaviour. We can tell so much about the reader with digital advertising, then we can analyse the data and act on the important statistics gathered. This was impossible to record from a printed publication. Tedious market research had to be done, and that was an extra cost that advertisers can easily avoid with digital publications currently. There is a high level of competition in the industry. Advertisers have made their move: Advertisers have shifted their spending from traditional print media to digital media. This has significantly affected magazine advertising and circulation in all regions. According to research and markets The global magazine publishing industry is anticipated to reach $106.9 billion by 2018, with a miniscule CAGR of 0.9% over the next five years. So watch this space. If you would like to try a free fully functional trial of 3D Issue software for converting PDF to digital HTML5 magazines – Please click here. 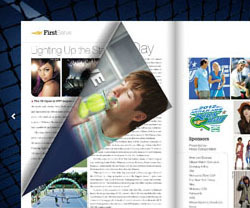 You too can experience the power and speed of magazine circulation and advertising first hand with your publication.